One moon. Two cats are not asleep. 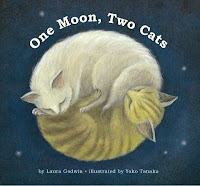 Across a great distance, but under the light of the same moon, a city cat and a country cat pounce and play, crouch and leap in a rollicking nighttime adventure. When morning comes, they are both back in their respective homes and finally, turn in to sleep.